A young refugee’s dream of riding a bicycle comes true at last when he arrives in America. Though he’s too short to reach the pedals, Joseph loves to help Daau, an older resident of the Kenyan refugee camp at Kakuma, fix and maintain his bicycle. 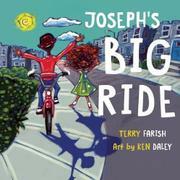 When Joseph and his mother leave the camp for America, though, he sees a bicycle that looks more his size. How can he persuade its owner, a classmate he dubs Whoosh for the way she zooms along, to lend it to him? His first try, a carefully drawn lion, she takes to be only a general offer of friendship. His second, a bandanna, she rejects because “I like my hair freeeeeee.” “Besides,” she goes on, “my bike broke. A tree hit it.” Third time’s the charm, as Joseph’s skill at bicycle repair earns him his longed-for ride—wobbly at first but soon steady and confident enough for no-hands. Cranking up the visual energy with quick, slashing brush strokes, Daley creates a generic urban setting for his dark-skinned young companions, tops Joseph’s new friend with a huge mop of flyaway hair that reflects her exuberant personality, and generally poses figures with widespread arms and welcoming smiles. In contrast to the traumas and cultural conflicts highlighted in many immigrant stories, such as Mary Hoffman and Karin Littlewood’s The Color of Home (2002) or Sarah Garland’s Azzi in Between (2013), Joseph’s adjustment from the outset seems relatively easy.